I have always been intrigued by how design is influenced by the interplay between fashion and film and the recent feature film The Great Gatsby is a hand in glove example of this relationship. The film showcases a collaboration between costume designer Catherine Martin and fashion designer Miuccia Prada with their creation of forty fashion gowns for the elaborate Gatsby party scenes. In the making of the film Catherine Martin and Prada played with the link between fashion and film, both reinterpreting the era through their own prism. As the head milliner on this massive costume production, I was able to witness this relationship first hand, both on the costumer shop floor at Sydney’s Fox Studios and then two years later in Prada’s Soho New York fashion store. The costume department was stockpiled in anticipation with shipments of men’s wear from Brooks Brothers, mountains of bling from J Crew, volumes of vintage baubles, buckles and buttons, hundreds of metres of heavily beaded Solstice fabrics from France and rack upon rack of vintage garments. Into this realm came the high end Prada garments which were unpacked, admired and hung on racks where they rubbed shoulders with other, less glamorous costumes. Hundreds of garments had been made by my costumier colleagues according to Catherine’s designs and many more still had been hired locally and internationally. The intermingling of all of these gowns was soon brought to life in many scenes of the film. These garments soon migrated from the world of the milliner and costumier back to the Mecca of high-end fashion – New York. The Prada building at 575 Broadway is a temple to high fashion and I found myself late one night in May reacquainted with the gowns and headpieces of Gatsby. The ‘Dress Gatsby’ exhibition held at the Prada store celebrated the collaboration in a static display of the garments along with their costume accessories, including the party headwear that I had the pleasure of making along with my team of milliners. Wild party costumes were now sentinels to fashion. 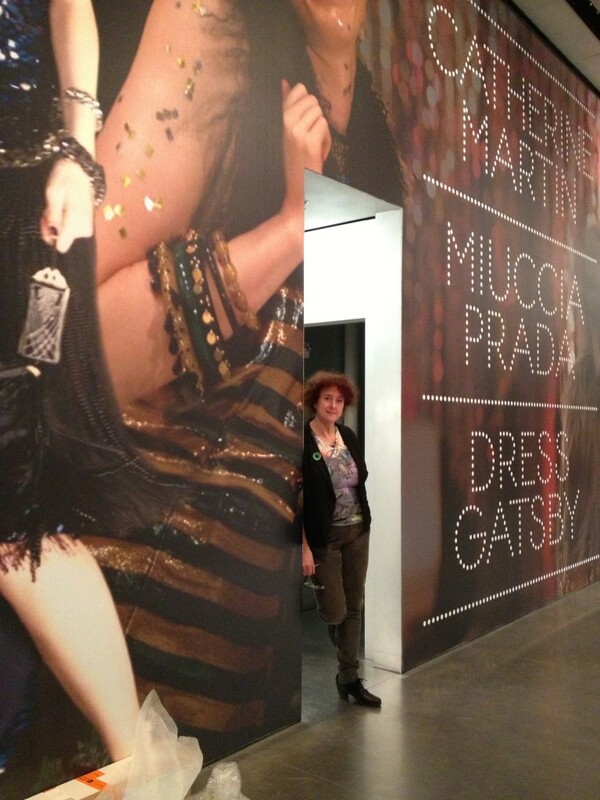 Seeing Gatsby finery both in our costume fitting department and again in the Prada Soho store I was able to experience the relationship between Muiccia Prada and Catherine Martin as both an insider and an admirer. The attention to detail by Prada to replicate exactly the costumes from the film and the reverence placed on these outfits within the fashion retail experience was both flattering and inspiring. I was touched by their desire to recreate our imaginary world.